Merlin Video gets even better! Several years ago, when we looked at our Merlin digital asset management product, we tried to find ways to make it more useful to our customers. Merlin already stored photos of most any format. Merlin also stored PDFs and graphic formats and indexed the information in the text layers for search-ability. We already had a really fast search engine that displayed results quickly. During the Olympics in London in 2012, some of our customers managed more than 5,000 new items per hour, and Merlin kept up; no surprise to us. We had powerful workflow tools including the ability to crop and resize jpgs. We reduced mouse-clicks with templates for searching, cropping and editing of metadata. We used “drag & drop” to add content to projects (you may call them collections or light boxes). We already did a lot, but it was not enough, and our customers were starting to use video in an ever-increasing manner. So, we decided several years ago to help our customers manage video, and we have been doing that for some time. For us, it is not a big deal to store video in most common formats. Since video formats differ so much, there really is not the equivalent of IPTC (embedded) standard metadata with video, or audio for that matter, and we wanted to make video (and audio) as searchable as photos. So in addition to storing it, we convert the spoken word in the audio track to searchable text. Not only that, we index the text with the time code of the video, so not only can a user search for the spoken word, they can go right to the place where the word was spoken. It is pretty cool and never fails to impress. Well, it’s been a few years, and it was time to revisit video (we have lots of other cool things going on at MerlinOne, that I cannot discuss yet, but I can tell you I am excited about the other projects). So, what can we do to improve the video experience for our users so that Merlin is even more useful? In a couple of words, search-ability, frame grabs and clip exports! We now support exporting marked frames as frame grabs. How cool is that!? You have always been able to label markers and clips in Merlin’s M5 rich client. Now those labels and tags are searchable. Simply apply a marker in the video (using the standard keyboard command “m”) and optionally apply searchable metadata to the marker. We made it easier to mark content…as a user slides the play head in the scrubber bar, we use frame stepping so that markers and clips may be created more accurately. Want to output the marked frame as a frame grab? Drag the marker to an output target in Merlin and deliver the frame grab as a JPEG WITH metadata added from Merlin, to the destination whether a local folder, or a remote server. Taking that a step further, we allow you to create “clips” in the M5 rich client. Again, these may be labeled with searchable tags and categorized. That is not new, but being able to search the tags is. 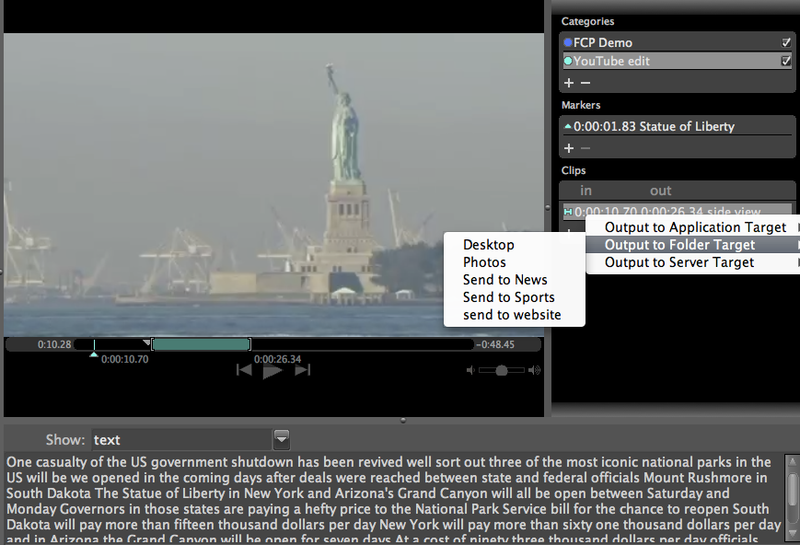 And, as you might have guessed, we now allow users to export the selected clip to output destinations. What a convenient way to create a sub-clip from a longer video and send it to your editing software or directly to your social media site. We’ve made it easier to create clips as well, using keyboard commands to set in the in and out points—even as the video is playing. That should be a terrific time-saver for MerlinOne customers who manage video in their Merlin DAM. There was a lot of “under the hood” work that was required to ensure this all worked properly with newer operating systems and to improve the overall video experience, so lots of work by a lot of different MerlinOne developers. My thanks to them for taking what was a great feature and making it even better. Want to see our new and improved video handling capabilities? Contact us for a demo!